Still Plays Video Games: CyberGeek Hottie of the Week! 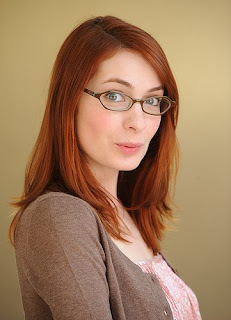 Felicia Day! Hey, it's ALL about E3 this week (and probably next week too, yawn). So, when the lovely Felicia popped up live at E3 with G4, we all went, "Whoohoo". Also, I might be trending, what is it about redheads? Enough of my mindless meanderings, SPVG's CyberGeek Hottie of the Week is, Felicia Day! She blogs, she sings, she dances, she's stunningly gorgeous, she's geeky, she writes a show about gaming geeks, she twitters, she "might" be able to perform enough miracles to be canonized, the Vatican has not gotten back to us yet. Saint Day, yeah, I'm good with that. Anyway, watch The Guild, it's well worth it, better, go buy the DVD's (Season 1 and 2 are out). Favorite line, "Codex is a fine prize of a woman." Priceless.